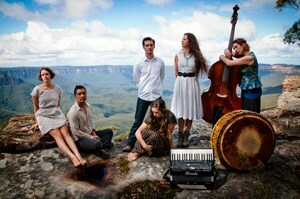 Saturday, 27 April 2019 from 5:30 PM to 9:00 PM + Add to calendar27/04/2019 17:3027/04/2019 21:00Australia/SydneyCHAIKA in concert at the Metropole for 'Metro Social' Katoomba, Blue Mountains - SAT 27th April 2019CHAIKA in concert at the Metropole for 'Metro Social' Katoomba, Blue Mountains - SAT 27th April 2019 Saturday, 27 April 2019 from 5:30 PM to 9:00 PM (AUS Eastern Standard Time) Organiser Charity Mirow 0409042869 info@fusionboutique.com.au Address The Metropole Guesthouse, upstairs "Metro Social" Cnr of Lurline and Gang Gang Streets Katoomba NSW 2780 Australia Event web page: https://www.stickytickets.com.au/81287/chaika_in_concert_at_the_metropole_for_metro_social_katoomba_blue_mountains__sat_27th_april_2019.aspxThe Metropole Guesthouse, upstairs "Metro Social"
This April, 2019, they will release their third LP ‘Arrow’ – an almost completely original suite of work injected with the compositional personalities of all 6 members. Chaika comprises of musicians who have written for and performed with a truly diverse roster, including Monsieur Camembert, Nahko and Medicine for the People, Nicky Bomba, The Brandenburg Orchestra, Riley Lee, Mara! & The Martenitsa Choir, The Song Company, The Rhythm Hunters, Kevin James, Baby et Lulu, Marais Ensemble, Elysian Fields, Miriam Lieberman Trio, Alireza Ghorbani, Great Waitress, Tángalo, Klezmer Divas, The London Bulgarian Choir, and The Renaissance Players, on major national and international stages.